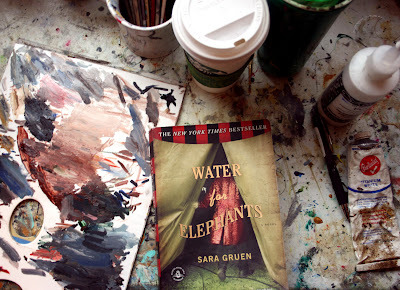 Have you read the book Water for Elephants? I read it recently and they are coming out with a movie with Reese Witherspoon. I totally loved the book, and it seems like everytime I fall in love with the book, I end up hating the movie. The book is about a journey of a young man and his adventures with love, the circus, and finding himself. This year I am a participating and donating a chair in the annual Community Warehouse Chair Affair. Artists refurbish chairs and then people bid on the chair in an auction and all the proceeds go to Community Warehouse. CW is an organization that collects and redistributes furniture to low income individuals and families. I wanted to paint a chair that had a little bit of spring, circus stripes, and the romance of the book. 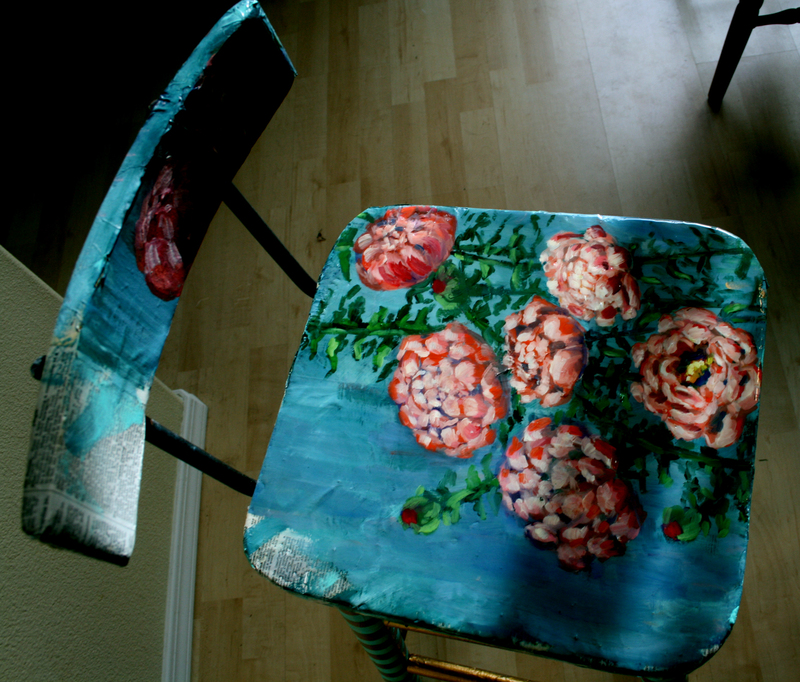 I collaged 1950's dictionary pages on the chair and painted peonies on the seat and back. The circus stripes are a scrumptious aqua and glittery gold. I did a coat of resin- so can sit in the chair :). Happy Hump day! Your chair is beautiful. Not only are you giving a 2nd life to the chair, but lending a hand to those in need. The chair is beautiful. Well done! I didn't like Water for Elephants. I haven't read the book but I've meaning to before the movie comes out! The chair looks LOVELY! I SO loved this book. So much. 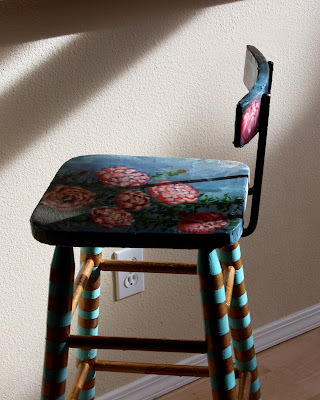 you chair is fantastic and fun! the dragon tattoo movies were not at all like the books, but i take them at face value. it's hard to pack everything into a two hour movie. the book sounds like a goodie. How have I lived in Portland my entire life and never heard of this event or organization?! I love the chair.......what a great way to contribute! Really cool chair! I need to do something like this...I seem to be in a rut lately...and thanks for the tip on the book...I've been looking for something new to read!! You're so gooood! That chair is awesome. I really want to read Water for Elephants, because I know that the book must be something good with all this buzz. I agree with you about the movies always sucking. I can't think of a single case where the movie was better - can you? Even Gone With the Wind was better in book version than movie! I agree, movies after books are so disappointing! Even when the movie's so-so it can really ruin the experience. What a beautiful chair! I think it would make any room stand out. I heard great things about Water for Elephants but since the movie's coming out, I'll just watch it instead. Can't wait to watch the movie~ the trailer looks so good! That book is on my 'to read' list but now I'm not sure if I should read it before or after the movie? I love Reese Witherspoon but am always sort of leery of screen adaptations of books because they rarely do the book justice. I love the chair! I didn't even know there was a book. Now I want to hurry and read it before the movie comes out. I have the release date of the movie in my day planner, so you can tell I am excited :) I just finished reading the book last month and am still waiting to find something that I love as much, any suggestions? P.S. The chair is beautiful, what a noble cause! the chair you painted it phenomenal! I was considering reading the book before I see the movie... or maybe I should do it backwards? At any rate, you inspired me to get it.